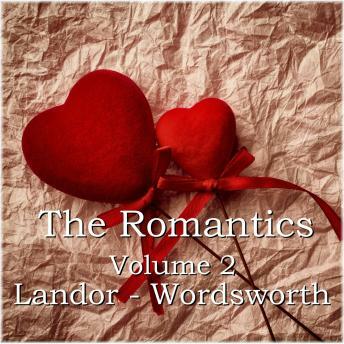 The Romantics - Volume 2 - An Introduction. Romanticism was a new movement in philosophy and the arts that began in the late 18th century when major political events shook the world such as the French Revolution and American Independence. It marked a distinct contrast to the prevailing Enlightenment ideals and in poetry represented a more personal intuitive, emotional and meditative expression with a back to nature imperative. It subsequently altered the way in which we perceive poetry and beyond as well as defining our own modern sensibilities to the arts. The Romantic poets who were central to this movement are traditionally characterised as the Big Six, namely Blake, Wordsworth, Coleridge, Keats, Shelley and Byron. However, as these volumes show, there are women poets who are often overlooked and these include Mary Shelley, Anna Laetitia Barbauld, Joanna Baillie and Charlotte Smith. Among our readers are Richard Mitchley and Ghizela Rowe. In this volume we collect together WS Landor to William Wordswoth.